1991 Con-sequences on Paper. Sedona Museum of Art, Sedona, Ariz.
1980 Dorothea Tanning. Yares Gallery, Scottsdale, Ariz.
1974 Dorothea Tanning. Galerie Jan Krugier, Geneva. 1973 En Chair et En Or, etchings. Galerie Editions Georges Visat, Paris. 1945 Dorothea Tanning. 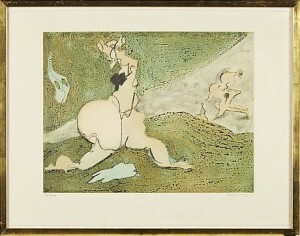 Caresse Crosby Gallery, Washington D.C.
Surreal Anatomies: Works on Paper by Hans Bellmer and Dorothea Tanning. Societe Man Ray. Walker Art Center, Minneapolis, Minn.
1999-2000 Surrealists in Exile and the Beginnings of the New York School. 1999 Dada Country: Duchamp and Friends in New Jersey. Hunterdon Museum of Art, Clinton, N.J.
Surrealism: Two Private Eyes, the Nesuhi Ertegun and Daniel Filipacchi Collections. The Inner Eye: Art Beyond the Visible. Touring Exhibition. The Body Politic: Surrealism on Both Sides of the Atlantic, 1927-1947. College of Creative Studies Gallery, University of California at Santa Barbara, Calif.
1994 American Fantastica. Parrish Art Museum, Southhampton, N.Y.
1984 Kafka. Center National d’Art Moderne, Centre Georges Pompidou, Paris. Surrealism in Chicago Collections. Museum of Contemporary Art, Chicago, IL. 1953 Six Artists: Gouaches, Acquarelles, Livres d’Art. Galerie Rene Drouin, Paris. 1946 San Francisco Museum of Fine Art Annual. 1993 James Merrill. Nine Lives. New York: Nadja Press. Cover drawing by the artist. color etchings by the artist. Kiepenheuer & Witsch), and Japanese (Tokyo: Saikisha Editions)..
1985 Stephen Yenser. Clos Camardon. New York: Seacliff Editions. Frontispiece lithograph by the artist. 1978 Jean Cassou. 22 Poems. St. Gall, Switzerland: Edition Ercker. One lithogrph by the artist. 1976 Bonjour Max Ernst. Paris: Editions Georges Visat. Album with one color etching by the artist. and ten poems by the artist. 1972 Judith. Paris: Manus Press. Album with six color lithographs by the artist. 1971 Hommage a Marcel Duchamp. Paris: Editions Georges Visat. Album with one etching by the artist. reproductions and text by the artist. 1969 Dorothea Tanning. Exhibition catalogue. Geneva: Galerie Alexandre Iolas. Five lithogrphas by the artist. 1964 Dorothea Tanning. Demain. Paris: Editions Georges Visat. Poem and five color etchings by the artist. 1962 Lena Leclercq. Personne. Paris: Editions Georges Visat. Nine color etchings by the artist. 1961 G. Luca. L’extreme occidental. Paris: Editions Meyer. Frontpiece by the artist. 1959 Rene Crevel. Accueil. Paris: Editions Jean Hugues. Fifteen color etchings by the artist. Alain Bosquet. Parloes peintes. Paris: Editions Galerie Diderot. Two etchings by the artist. 1950 Almanac Surrealist. Paris: Saggitaire. Three ink drawings by the artist. 1944 Ramon Sartoris. Three Plays. New York: Black Sun Press. Pencil drawings by the artist. 2005 Howard, Richard and Charles Stuckey. Dorothea Tanning: Insomnias 1955–1965. 1993 Buck, Louisa. Dorothea Tanning. London: Camden Arts Center. retrospective exhibition. Texts by Sune Nordgren, John Russell, Alain Jouffroy, Sweden. Delirium. New York: New York Public Library. 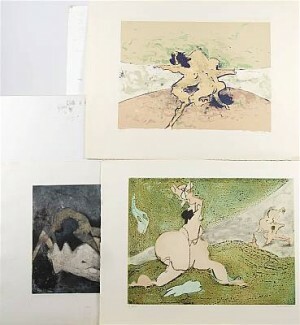 A retrospective of Dorothea Tanning’s prints. 1991 Trotter, Ruth. For Dorothea Tanning: Consequences on Paper. Sedona: Sedona Museum of Art. 1990 Morgan, Robert C. Dorothea Tanning: Messages. New York: Nahan Contemporary Gallery. 1989 Wilson, Sarah. Dorothea Tanning: Between Lives: Works on Paper. London: Runkle-Hue Williams. for Dorothea. New York, Kent Fine Art. 1987 Kuspit, Donald. 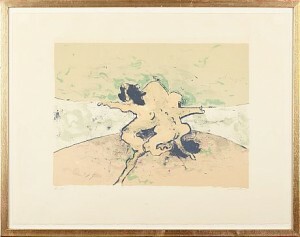 Dorothea Tanning, On Paper. New York: Kent Fine Art. 1979 Dorothea Tanning. 10 Recent Paintings and a Biography. New York: Gimple-Weitzenhoffer Gallery. 1977 Dorothea Taning: Numero Special de XXe Siècle. Paris: Editions XXe Siècle. Masson, Matta, and Joan Miro. 1976 Plazy, Giles. Dorothea Tanning. Paris: Editions Filipacchi. 1975 Hulten, Pontus. Dorothea Tanning. Stockholm: Galerie Bel’Art. 1967 Waldberg, Patrick. “Dorothea Tanning et les enfants de la nuit.” In Dorothea Tanning. Retrospective exhibition catalogue. Brussels: André de Rache (for the XXe Festival Belge d’Ete). 1966 Bosquet, Alain. La Peinture de Dorothea Tanning. Paris: Jean-Jacques Pauvert. Lebel, Robert. Prose pour Dorothea Tanning. Paris: Galerie Le Point Cardinal. 1962 Bosquet, Alain. Dorothea Tanning. Paris: Galerie mouradian et Vallotton. 1961 Arp, Jean. Jeux des epis d’or for Dorothea Tanning, dessins. Paris: Galerie Le Point Cardinal. Carluccio, Luigi. Dorothea Tanning. Turin: Galerie Galatea. Jean-Louis Bedouin and Andre Pieyre de Mandiargues. 1944 Ernst, Max. Paintings by Dorothea Tanning. New York: Julien Levy Gallery. Jean Louis Barrault. Costumes by the artist. 1953 Will o’ the Wisp. New York City Ballet, New York. Choreography by Ruthanna Boris. Sets and costumes by the artist. music by Virgil Thomson. Sets and costumes by the artist. 1950 The Witch. Sadlers Wells with the New York City Ballet, Covent Garden, London. Choreography by John Cranko. Sets and costumes by the artist. George Balanchine, music by Vittorio Rieti. Sets and Costumes by the artist. and Munich. Grand Prize for Direction, Festival International du Film d’Art, Palmares, 1981. Desvilles, Les Productions Tanit, Paris. 1956 8 x 8. Film by Hans Richter. Performance by the artist. 1944 Dreams That Money Can Buy. Film by Hans Richter. Performance by the artist.